At this point in our trip, I figured if you’re going to eat unhealthily, you may as well go all out. And so our group headed to Jacques Imo’s for dinner. Jacques Imo’s is part dive, part chic, part Creole, and part imagination. The dishes are like Willy Wonka for the New Orleanian soul. Naturally, we started with the alligator sausage cheesecake. 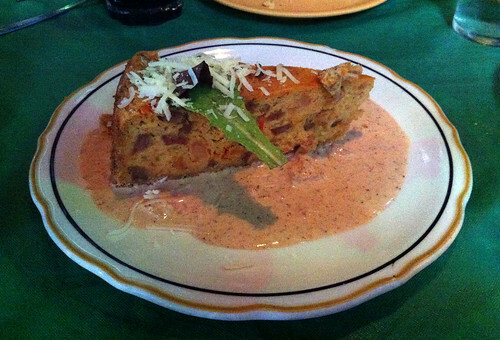 Despite the name, this “cheesecake” tastes more like a quiche and the alligator tasted well, kind of like chicken. (Or frog. You know, that chicken-y, vaguely seafood-y taste.) Flecked with shrimp and bound together with copious amounts of butter and cheese, one slice was more than enough. I ordered the frighteningly-named Godzilla meets fried tomatoes as my entree. What the hell is that? You might ask. 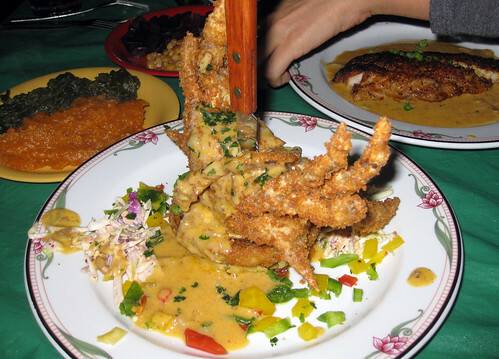 It’s a deep-fried soft shell crab, served on top of a pile of fried green tomatoes and eggplant. Oh, and it’s served with a knife sticking straight out of the crab. This dish wins at presentation and despite it being incredibly rich (are you noticing a trend here? ), it was pretty tasty. I love soft-shell crab, served like a crime scene or not. I woke up the next day needing something a bit lighter for lunch, so we headed towards the trendy Magazine Street for a bite. We stopped at Sucre, a beautiful, sleek ice cream, macarons, and chocolate shop serving some of the prettiest desserts I’ve ever seen. 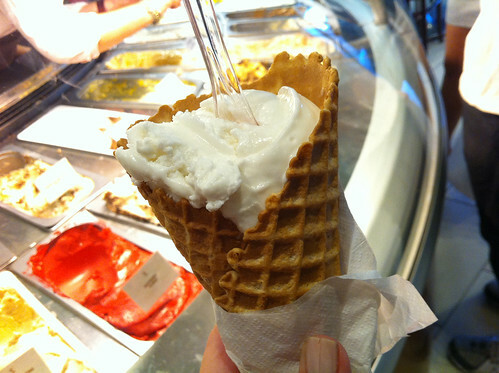 I kept things simple with a creamy coconut-basil sorbet, perfect for countering the southern humidity. 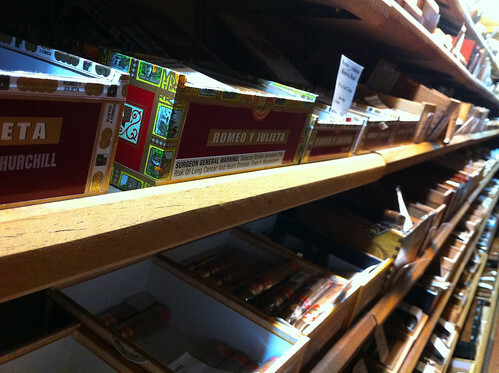 Afterwards, we walked to the Mayan Import Company and bought a few Cohiba cigars, perfect for evening porch-lounging and whiskey-swilling. Before we headed back, we stopped at Joey K’s for dinner. I needed something vaguely healthy, so I ordered a shrimp remoulade salad and gumbo. 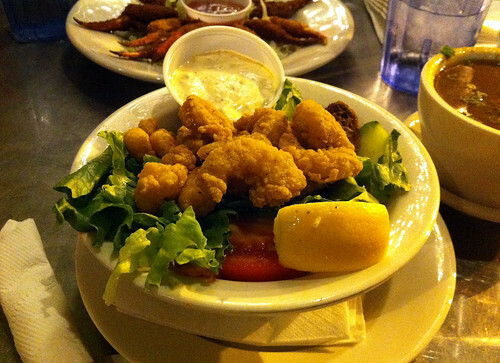 The shrimp was deep-fried but hey, lettuce! The gumbo was my only real disappointment; it was too salty and lacked depth of flavor. Still, not much beats balmy outdoor seating on a warm southern night. We continued our outdoor theme when we arrived to the flat we were staying at. We lit our Cohibas, mixed a few Jack and Cokes, and waxed poetic well into the night. 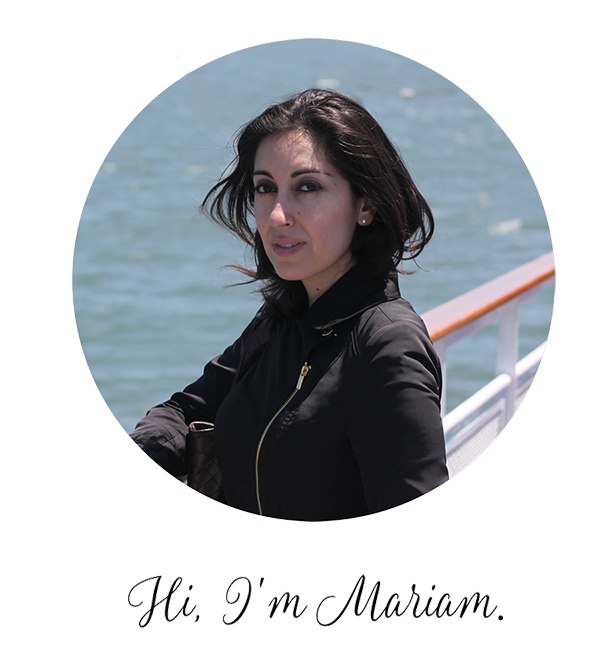 The next day, we woke up late and lazily strolled around the neighborhood, paying a visit to the beautiful Audobon Park before returning to pack our luggage in preparation for our return flights the next day. We grabbed dinner at the Camellia Grill: fried chicken and French fries with a side of coleslaw and chocolate pecan pie to wash it all down. Our trip was almost over, and it’d be futile to try to start eating healthy now. Another porch-lit evening followed and on the last day, we grabbed our bags and headed to the airport, knowing that New Orleans had changed us — and I don’t mean just our waistlines. We said our goodbyes, with one of us headed towards Alberta and the rest back to the West Coast. Next stop: Canada. Any country that invented poutine is a fine country indeed. My trip to NOLA quickly became characterized by late nights and even later mornings. Breakfast was optional and on our third day, my first meal was an afternoon plate of crawfish etouffee. The name of the French Quarter restaurant where I ate this escapes me now, but oh man, was this rich. 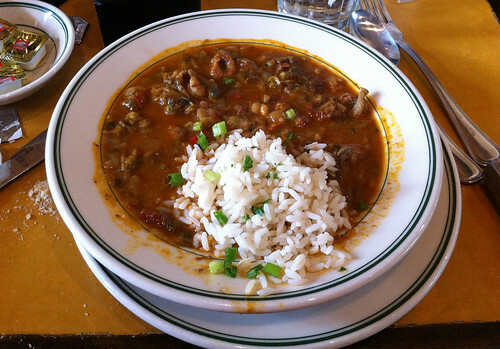 Etouffee is a creole dish that’s made of shellfish, highly seasoned, thicker than a stew, and served with rice. I tried, but I couldn’t finish my plate. Afterward, we walked it off along the Mississippi River. No trip to the French Quarter is complete without a visit to the infamous Cafe Du Monde, and instead of dinner, our group headed to the cafe for beignets and cafe au lait. Napkins are not optional here and you will make a mess. 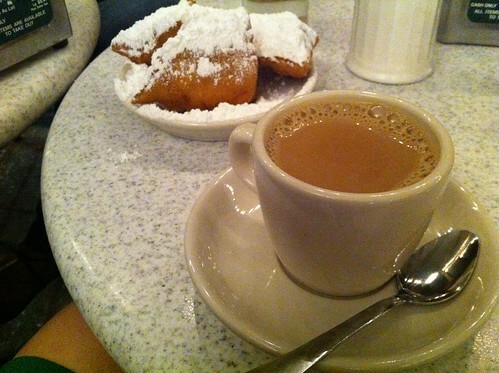 It’s worth it, though, and what better to wash down these fluffy, sweet, ethereal beignets than with milky coffee? We walked out in a sugar-induced stupor, high on junk food and wanting more. Naturally, we went towards Bourbon Street, home of spring breaking frat boys, neon slushy hurricanes, and questionable pizzas kept warm under fluorescent lighting. 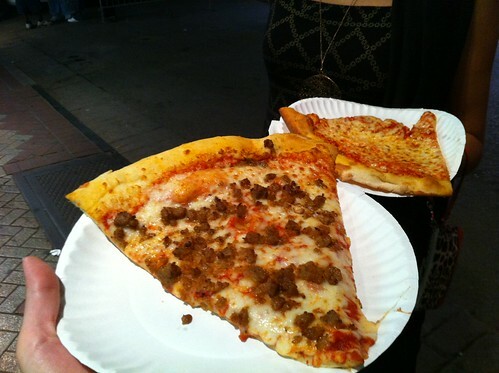 I’ll have one slice of mystery meat pizza, please. My pizza tasted like regret and loathing, but I washed it down with rum and all was good in the world again. Speaking of rum, our group headed to the Garden District’s Rum House the next day for lunch. The Garden District was a breath of fresh air from the tourist-flanked French Quarter, and we took in the quiet(er) surroundings on Rum House’s outdoor picnic seating. 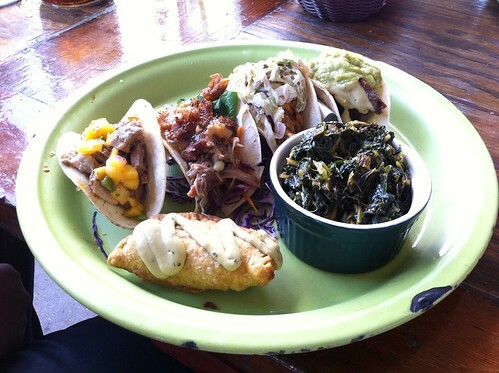 I had a plate of “tacos” (note to the uninitiated: these are not your standard Mexican tacos), collard greens, and a patty. If you think these items don’t typically go together, you’re right, they don’t. My tacos were tasty, but the patty left a lot of flavor to be desired. 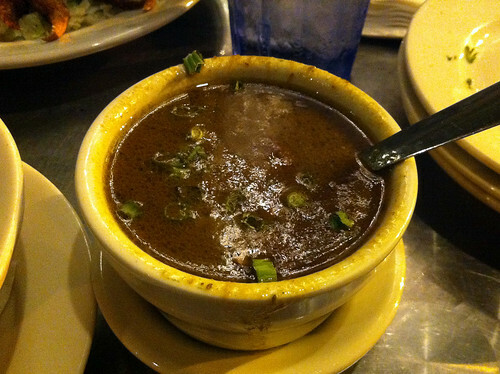 The collard greens made me crave gumbo. Still, the ambiance at Rum House couldn’t be beat. 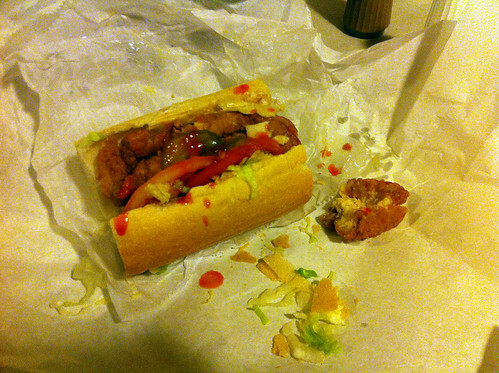 Later that night we headed towards Parkway Bakery & Tavern for purportedly one of the best po’ boys in town. My heart wanted a fried oyster po’boy, but I ordered a catfish po’ boy instead, because I hear having to use your epi-pen on vacation is kind of a bummer. This baby was messy, especially with all the Crystal hot sauce I poured all over it. The catfish was greasy, flaky, and spicy. In other words, just right. After four days in New Orleans, I was beginning to realize this was no country for health food. Po’ boys. Sazeracs. Gumbo. Oysters. Wait, scratch that. No oysters. After an unfortunate bout with oysters on the half shell last year, I learned that I’m now allergic to my favorite shellfish. And so I found myself in New Orleans a few months ago for a friend’s sister’s wedding, oyster shacks taunting me at every other corner, unable to imbibe on their sweet, salty nectar. No matter. New Orleans is a culinary and cultural force to be reckoned with, and our group set out to tackle the city. 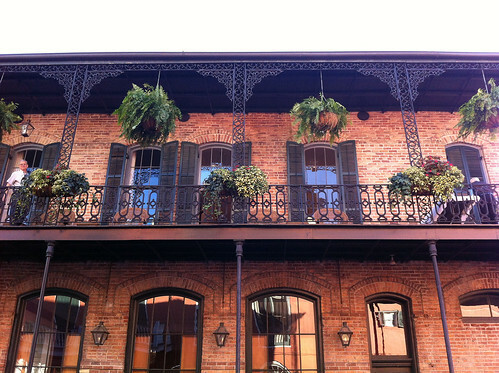 My first day in NOLA was spent lolling around in the sun in the French Quarter’s beautiful Jackson Square. Designed after Paris’ Place des Vosges in the 1800s, it’s a host to live music, impromptu concerts, and a smattering of fortune tellers. We woke up late on our second day in New Orleans, and after a late night out, we needed fuel. Off to Central Grocery we went for a sandwich. Ladies and gentlemen, this isn’t any old sandwich. 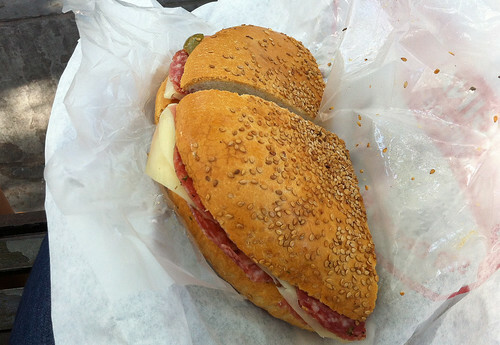 This is a muffuletta, and perhaps the world’s greatest. Picture Sicilian sesame bread covered with layers of marinated olive salad, capicola, mortadella, salami, pepperoni, ham, Swiss cheese, and provolone. Now picture being able to only eat a quarter of it. The remaining three-quarters would make for a great post-wedding midnight snack.